Connecticut head coach Geno Auriemma gestures during practice at the women's Final Four NCAA college basketball tournament, Thursday, April 4, 2019, in Tampa, Florida. UConn faces Notre Dame in a national semifinal on Friday. 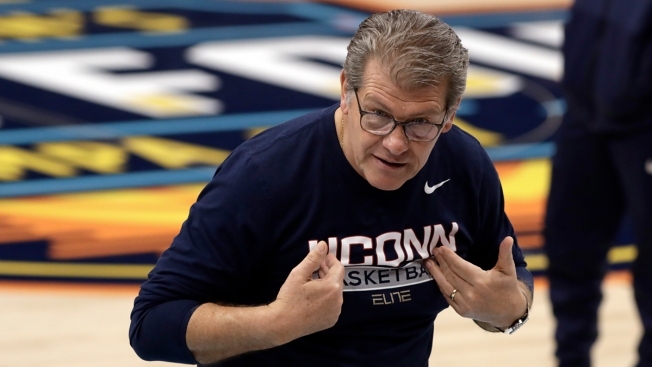 There's a different vibe around Geno Auriemma and his UConn Huskies at this year's Final Four. Unlike the previous two years, they don't have the burden of a record winning streak or an unbeaten season. Samuelson and Collier have combined for 4,708 points which is the highest combo for a pair of classmates in school history. ... The starting five for Notre Dame has combined to score over 10,070 points that is No. 1 in the history of men's and women's basketball. ... This is the 50th meeting between the schools and UConn holds a 37-12 lead in the all-time series. "Well, I don't think we can really top last year," she said. "What happened last year was amazing. We're here to win, however we have to do it, whatever fashion, we're just here to win. That's what we're focused on." Irish forward Brianna Turner missed last year's championship run because of an ACL tear. She was happy to have the chance to play this year on the biggest stage. "It was really exciting to see the success of our team last year. But, I mean, my injuries are in the past. I'm really just looking forward. I'm excited for my last weekend of, like, college athletics. I'm really soaking it all in," Turner said. "We're all really excited to play tomorrow night."